Most biker knows how fun is it to ride that two-wheeler on the road. The bike has the ability to get through traffic faster. A rider should not sit in traffic for hours on end, in highly congested areas.�Moreover, the bike consumes a less parking space and it is the cost-effective vehicle, cheaper in comparison to other vehicles. In this article, we talk about the latest bike price in Nepal. Bike riders in Nepal are increasing nowadays even though the bike price in Nepal is high in comparison to other countries. Bike prices vary from one brand to other and one model to another. Mostly the riders are youngsters. The bike with the style, mileage, and a fair price is more preferred by most of the Nepalese people while some may go for the sporty look, tour bike or other types. Lots of bikes are available in Nepal. Nepalese youngsters are craze of having latest model bike available in Nepal. 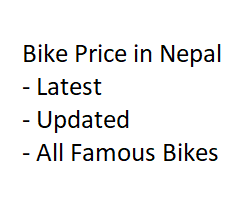 Here are few lists of bikes that are available in Nepal. Aprilia, Europe’s second largest motorcycles and scooters producer’s bike and scooter are now in Nepal. Aprilia SR150 Race, one of the models from Aprilia has an engine displacement of 154.8cc. It has a fuel tank which has a capacity to hold the 6.5 liters fuel. Aprilia SR150 Race weighs 122 kg and gives a 50 kmpl mileage (city). Top speed is 104 kmph. Max power is 10.4 bhp @ 6750 rpm while max torque is [email protected] rpm. The bike has followed the current trend of tubeless�tyre as they are more efficient and very reliable. Bajaj has introduced a Pulsar 220F bike with a 220cc engine. It has a mileage of 35 kmpl which is a pretty good thing. Pulsar needs no introduction as it is one of the favourite bikes of Nepalese people. Many Nepalese people are riding Bajaj motorbikes. Bajaj Pulsar 220F bike is Indian manufactured two-wheeler. The bike has a max power of 21 PS @ 8,500 rpm and a torque of 19 Nm @ 7,000 rpm. A bike rider can go up to the top speed of 134 kmph. The number of gears is 5. A fuel tank has the capacity to hold a petrol of 15L (3.2 reserve). The bike weighs about 150 kilograms. Benelli motorcycle is popular among the youth of Nepal. The bike has a genuine design which looks stylish while riding. Ride in a top speed of 120 kmph with a good mileage capacity. The Benelli TNT 135 is 135cc. It has 5 gears. Fuel capacity is 7.2 liters. max power of the bike is 13 bhp @ 9000 rpm while max torque is 10 Nm @ 7000 rpm. The weight of the bike is pretty satisfactory i.e. 121 kgs. Hartford VR 200 bike is good for dirt biking. 197cc Hartford can be ride easily in a strenuous ride, incorporating jumps, hills and other obstacles letting its riders to gain the full fun and advantage of dirt bike riding. A mileage 30 kmpl is pretty enough for dirt bike riders. Max power of the machine is 19.18 [email protected] 7500 rpm and the�torque is 10.09 Nm @ 6000 rpm.�5 Gears are good enough.�The fuel tank of 12 liters, the�kerb weight 140kg and a good looks make the bike awesome and stand out from other motorcycles in the market. CFMOTO ST. Papio, another motorcycle having a unique design and look in the Nepali market. The two-wheeler has 124.5 cc engine along the�mileage of 20 kmpl. The bike is small and it fits the people who are short in height. Talking about the power this mini bike has the�max power of 9.39 HP (6.9 kW)) @ 8500 RPM and the�torque of 8.30 Nm (0.8 kgf-m or 6.1 ft.lbs) @ 6500 RPM. Another interesting thing about the bike is gear system, it has 6 gears and has a top speed of 90.0 km/h (55.9 mph).�Not to mention the amazing fuel tank which has the ability to store 7 liters of petroleum.�The bike has a Kerb weight of ‎116 kg. It is a fact that motorbikes outperform cars while talking about how many km’s you can get per liter of petrol. Similarly, insurance fees are also low than the cars. Thus motorcycles are boon to the human being. This kind of scientific discovery and innovation should be used for good purposes and positive changes. Everyone should be trying to get the full usage and optimize the full potential of this mechanical machine. Misuse of the product will only take an individual towards the disappointed and waste of the time and money. So it is wise to ride them for a good work and the development and happiness of oneself and other people. We can’t avoid an accident but it can be minimized if we are careful.